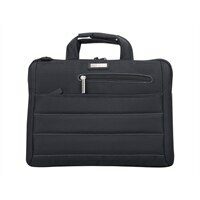 Sports Voyage Messenger case is stylish and feature rich and will accommodate laptops up to 16.4". Second zippered compartment will accommodate additional accessories. ECO STYLE Tech Ultra - Laptop carrying case - 14.1-inch - blackSports Voyage Messenger case is stylish and feature rich and will accommodate laptops up to 16.4". Second zippered compartment will accommodate additional accessories.